Johnny Brenden welcomes Sarah Carzenas & guest Stephanie Livesey, Hot 104.7 Brenden Flyaway Winners for the premiere of “SAW III” at Brenden Theatres at the Palms Casino Resort, Las Vegas! 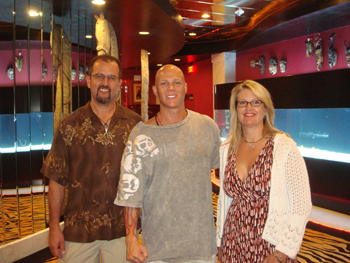 Congratulations to another Las Vegas Fly-a-way winner…this time from Vacaville, Ca. Flown to Las Vegas to attend the “Superman Returns” Premiere at the Brenden Theatres Las Vegas at the Palms! Here they are doing a meet and greet with Superman himself, Dean Cain. 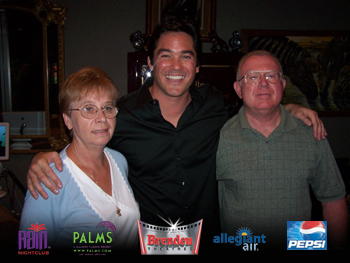 Brenden Theatre Corporation CEO Johnny Brenden welcomes Fandango Indiana Jones Fly-A-Way winners, Rafael and Colleen Berumen from Vacaville, CA to the Brenden Celebrity Suite in Las Vegas!